I was sitting in a very tiny cinema in the heart of the Gum San Museum with my young son. A short film was running through for the second time. In black and white, a boy was saying goodbye to his sister on the shore of a lake next to their village in Canton. He was about 17 and had to leave his family to find gold—so that they could be saved from devastating poverty. It was 1857 and the clouds around their hearts were almost visible. I related to that girl. Being left behind. Watching a beloved person walk away with the strong sense that he may never come back. Although my mind shied away from it, I could not help imagining how I would feel if that was my beautiful little son? It left a very strong impression. My mother was recovering from surgery and needed to get away from Melbourne. I suggested we go for a Paint Out holiday. That is what we call our plein air painting expeditions. We have clocked up many hours chasing the light around southern Victoria. Mum was excited and we spent a few days deliberating on where to go. It was May 2016 and it was cold. I proposed that we follow the route taken by the Chinese miners in 1857. I wanted to see where that brother walked. We would start in Robe and work our way to the gold fields. There must be lots of beautiful scenery along there and it would take about a week. Mum had lived in China, so she was interested in the story. We headed off. I was not thinking of Mei Ling at that stage. I just wanted to see the landscapes and feel what it would be like to trek through, carrying all you owned on bamboo poles. Knowing Australia, I thought it would be epic. And it really was. We saw seascapes that literally blow your skin off. Scrub of the most tangled and vicious kind. Weird grass trees that spring up after a bushfire. Endless miles of natural, undulating meadows. Sharp mountain edges backlit by winter storm clouds. Lots of winter storm clouds. Sunsets of pure, molten gold. Our canvases got rained on, blown away and fried in the sun. I discovered that oil paint really stings if you get it in your eyes. I think it was the oil paint, anyway. We made it to Dunkeld, having just left Casterton where a Kelpie Muster was in progress. (Every red dog in Australia, and their owner, was in town. But that’s another story.) We walked around town and found a remnant of a Chinese market garden. Mount Sturgeon was towering over us and a storm was just about to break. I read that some of the walkers never got to the goldfields. Instead they worked in these gardens, cooked and helped to build walls, cellars and buildings in the region for their community and for the local settlers. One of these could be the lone woman. I’d been hearing about this lone woman all along the route. There are countless references to her in the official records. But no one knows her name or her age. I started to feel that people were fascinated by the mystery of her invisible trek and were starting to weave her into their ‘historic records’. Then I remembered my feeling at the Gum San cinema and knew why. We can all relate to those that were left behind. But we can REALLY relate to the one that wasn’t. 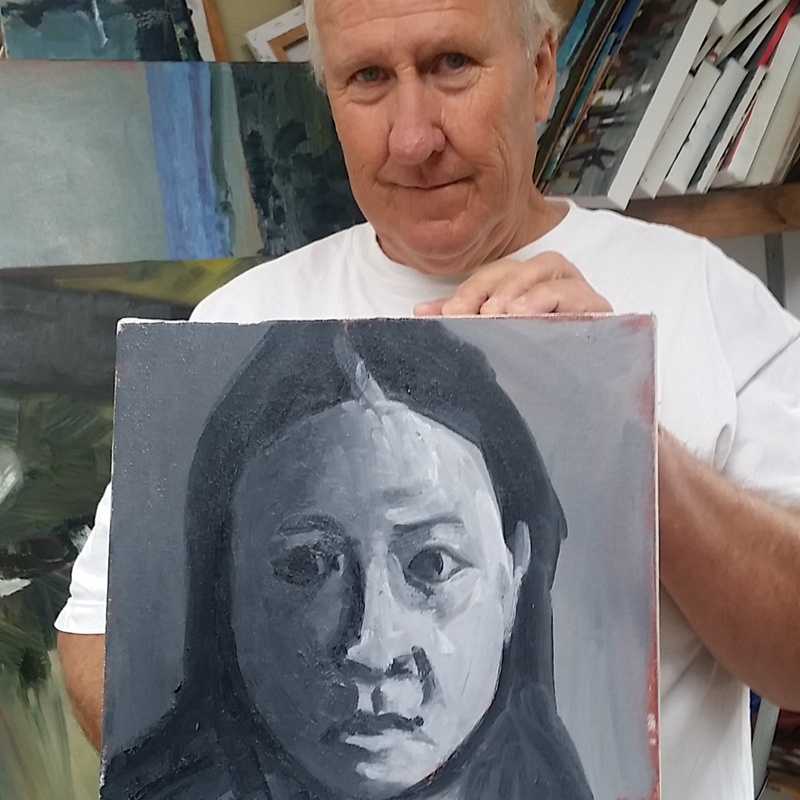 Clive Sinclair with his portrait interpretation of Mei Ling. I went on a flight of imagination. What if that boy’s sister actually had to follow him? What circumstances would have led to such a break from tradition? I was in our cabin painting a scene overlooking Casterton town and I imagined this girl arriving there. Would she venture in? Or would she go straight to the Chinese commune in nearby Sandford? How would she be received. Then I realized why she became invisible—at least officially. She and her family honour had to be protected. Then I had this really strong sense of a great big conspiracy carrying her across the country. Hiding her from the authorities, making sure she was safe. A bit like Frodo “the ringbearer” heading for Mordor, in the Lord of the Rings. By the time I finished that painting I knew I wanted to create a story about her. I called her Mei Ling (like Mulan) and she has been keeping me awake at night ever since. Video of Mei Ling’s arrival at the Chinese Commune in Sandford, Victoria.